Buying a bike is all about compromises. You can get a cheap one at Target, but it'll be heavy and have low-end components. Or you could get a light bike with killer components, but you'll be paying through the nose. Priority Bicycles is a new company that thinks it's found the sweet spot: A cheap, light, "maintenance free" bike, with quality components. 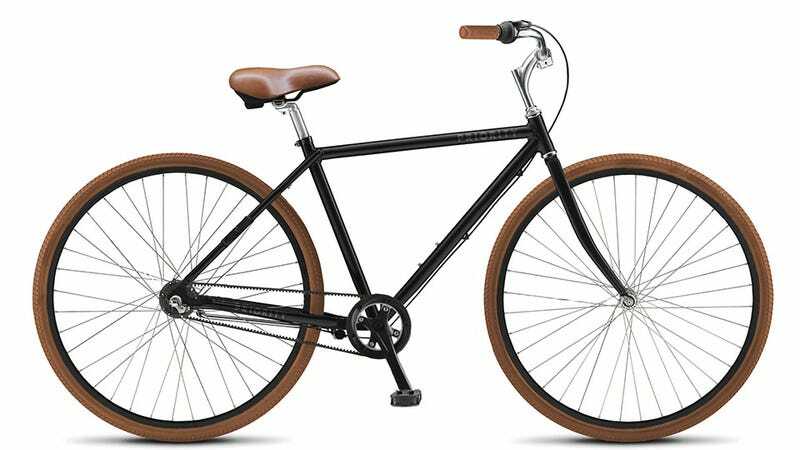 Priority's first bikes (men's and women's models) will be straight up commuters. They're basically designed for getting around the city as cheaply and comfortably as possible. They're made with aluminum frames to keep them lightweight and easy to carry up stairs. They have three speeds via an internal hub, and instead of a chain and gears they use a belt drive system, which you typically only see on higher-end setups. Not only do these things cut weight, but they are designed to make the bike "maintenance-free." Obviously, no bike could every be fully maintenance-free (you gotta keep air in the tires somehow), but Priority has tried to eliminate a lot of it. For starters, the belt drive is a lube-free affair, so you never have to add grease, and rust shouldn't be a problem (also, no grease on your pants if you're commuting to work). Priority is using the C-Drive system, which has gotten extremely popular in Europe but hasn't blown up stateside yet. Derailleurs and hand-brakes are among the most common things a bike needs to have adjusted and fixed, so Priority eliminated them. They found that Shimano makes a really nice three-speed internal geared hub with a foot brake, which, according to them, should go "thousands of miles and many years without ever needing service." They also claim that foot brakes have come a long way since we were kids and don't skid out like they used to. According to Priority Bike's founder, Dave Weiner (who worked as a bike mechanic for many years), after chain, derailleur, and brake problems, the next most frequent fixes are flat tires and bent wheels. This isn't something that can be totally avoided, but to help combat it Priority uses puncture-resistant tires and double-wall rims, which should help to keep them straight. Even if they do get a little bent, though, there are no brake pads, so that annoying rubbing shouldn't be a problem. All that and it's actually a pretty good-looking bike. They definitely don't look cheap, but they are. During their Kickstarter campaign (which is just now going live), you'll be able to get a Priority bike for $350, which includes a floor-pump with pressure gauge, and free shipping. Assuming these bikes actually work, that's a sick deal. Once the Kickstarter campaign ends they'll be sold directly from Priority's website for $400, which is still pretty reasonable. We asked Weiner how they are managing to sell these that cheaply. He answer was basically that by selling directly to consumers, they're able to cut out the middleman and avoid some serious mark-ups. Dave has been in the bike industry for decades, working for some major companies like Giant, and in that time he managed to build up a considerable list of supply-chain contacts, which helps too. Obviously, anything on Kickstarter has a bit of "buyer beware" attached to it, but these guys have legit credentials, the the bike looks pretty solid to us. Plus, Each bike comes with a satisfaction guarantee—if you don't love the product, "Priority will take the bike back no questions asked." You're probably not going to want to run any triathlons with it, but as an everyday, getting-around-the-city-bike, you could do a lot worse. Plus, for $350, it'll save you a little heartbreak when it eventually gets stolen.